New York is known as the City that never sleeps, and, the Big Apple. Today's Nice Price or Crack Pipe '64 New Yorker is painted black which seems appropriate considering the city's unofficial dress code, but will its price have you saying I'M WALKIN' HERE, I'M WALKIN' HERE? Unsurprisingly, yesterday's Maserati Quattroporte walked away with a 68% Nice Price win. I say unsurprising because any time someone says fifty-five hundred and Maserati in the same breath - and they're not talking about a repair bill, or a Biturbo - it's a pretty good deal. One thing that Italian had - in spades - was presence, what its angular designer clothes, and cow-rich interior. The fact that its size makes it look like something the Italian Navy lands-a da-planes on helps too, but it's nothing compared to today's contender. The New Yorker nameplate goes waaaay back, originally appearing as a special package on the pre-war Imperial. After the war it became a distinct model, slotted below the Imperial, and, by the 1950s, received its styling from one of the era's most flamboyant designers. In the fifties and early sixties the American dream was to live in an all-glass house, listen to jazz on your quadraphonic sound system, drink martinis at lunch, and have a car styled by Virgil Exner. An apprentice of Raymond Loewy, and having previously penned for Studebaker, Exner was a good choice to give Chrysler's top models their stand-out flair. Exner's influence is demonstrated on this 1964 New Yorker pillarless station wagon but this would mark the the last year for both the designer's work and the body style at Chrysler. Painted an elegant black - which is claimed the factory spray job - the 122-inch wheelbase and 215-inch overall body is an imposing sight. 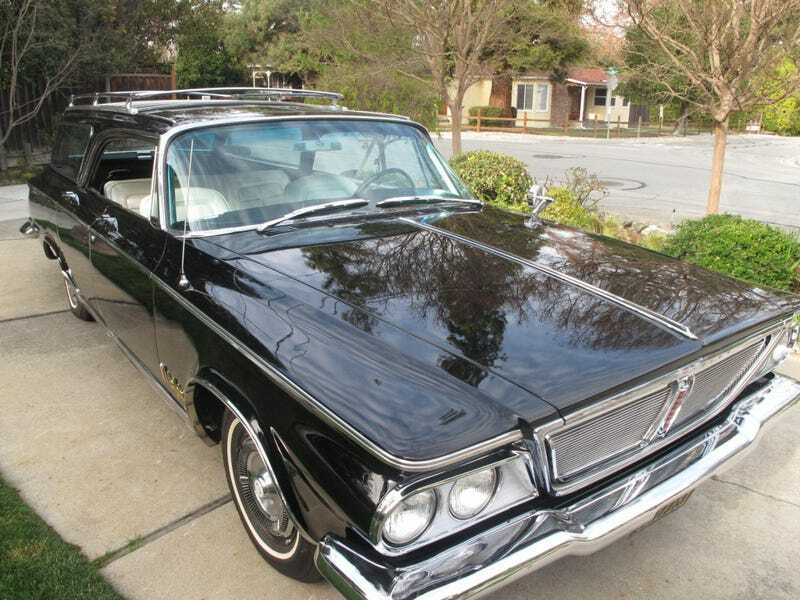 The seller says that the car has been in the family for more than 48 years, the entire time owned by his grandfather. Gramps has done a miraculous job preserving this 4,250-lb behemoth over that time and its 109,000 miles, as it is described, and appears, as being in as-new condition. Look at the white vinyl on those mesa-like split bench seats - there's not a sag nor discoloration anywhere. It's as though over its life, no one has so much as farted within twenty yards of it. The remainder of the interior- carpet, headliner, and two additional benches, are equally clean, and the level of ‘60s styling detail is astounding - square steering wheel anyone? Outside it's much the same, the paint showing no sign of age nor the chrome - of which there is plenty - exhibiting a total lack of clouding or pitting. The roof rack looks like something tourists view city sights from and draws down into a pair of clever hand holds bracketing the rear glass. Even the rubber moldings and weather seals are said to still be as supple as a virgin's thighs - well, maybe not described exactly in that manner, but you get the picture. Powering this survivor is a 413 cubic inch Wedge, an engine good, when new, for 340-bhp. Backing that up is a Torqueflite automatic, but it's not actuated by a lever, preferring to have its buttons pushed in being told which direction is desired. Back in the day, Chrysler advertised the optioned-out New Yorker as the world's most complete car, and this one could easily take the title of most complete survivor due to its Dorian Gray appearance. The question remains however, would anyone be the world's most complete fool for paying twenty five large for it?